From islands, ancient ruins and sparkling beaches to bustling cities, delicious cuisines, cultures and languages - all can be discovered in the Mediterranean. Mediterranean Europe is the world's top cruising destination, welcoming over 200 million tourists annually. One of the main appeals of the Mediterranean is the mild climate - the promise of summer sun and long lazy beach days. The beaches of the Mediterranean are understandably the top reason for the flood of tourists - from the brimming beaches of the Greek Isles including Lefkada and Elafonissi (Crete), the Spiaggia Rosa in Sardinia to the spectacular spanish coastlines such as the Cabo de Gata in Andalucia. There's much more to the region than its beaches however, there are plenty of places to explore the fascinating ancient history of the region, the deliciously rich cuisine and the beautiful cultures. The region has an unparalleled cultural legacy and offers diverse and divine culinary experiences. The exotic cultures, cuisines and history of the countries along the Mediterranean coast are rich and varied, with each city and town having something unique and special to offer. Discover places like the Vatican City and the Colosseum in Italy, the Acropolis and the Parthenon in Greece and many others that fill the Mediterranean region. Not sure what company to cruise with? If you are only interested in seeing the 'biggest hits' of the Mediterranean Sea that visit ports like Rome, Barcelona and Florence, consider cruising with Royal Caribbean, Celebrity or Princess. If you want more of an authentic European feel with lots of small hard-to-reach destinations, book MSC Cruises or Costa that have shorter sailings, but less time in port. Is luxury your style? Our Cruise Experts will help you find the perfect itinerary with Regent Seven Seas, Azamara, Oceania or similar. Royal Caribbean's 8 night visit to Greece from/to Venice. This ship offers so many amenities, 8 nights won't be long enough to explore it, but try anyway. Spend 14 nights on board Oceana, to sample some of the best spots in the Mediterranean. 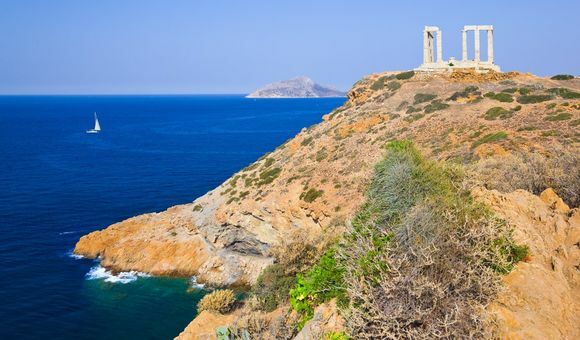 A round trip from Malta, you'll discover Greek islands such as Rhodes and Crete, as well as some iconic Italian cities. When not exploring new cities, sit back and relax while enjoying the included on board entertainment. This 7 night cruise takes in some of the best of the Mediterranean in a small time period. Prepare to be enchanted with the array of colourful charm made up of fishing boats, windmills and stunning architecture in Mykonos, Greece! 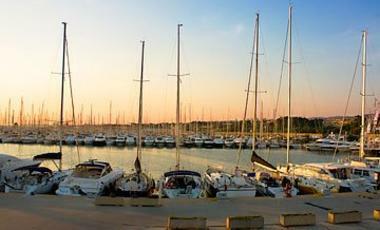 Civitavecchia is located in the province of Rome and is a gateway to the city. Rome is Italy's largest city, and is bursting with Italian history and culture. The Old Town, St. Peter's Basilica and the Vatican City are on the list of UNESCO World Heritage Site since 1980. In the 'Eternal City' there is so much to discover, such as many theater performances to enjoy and museums with fascinating exhibits. A highlight of Rome is the food available, with the huge number of bars, restaurants and cafes sure to satisfy. A blend of the traditional and modernity makes Barcelona one of the most beautiful cities in Spain. With approximately 1.62 million inhabitants, Barcelona is also the second largest city in the country. Among the attractions are the Nou Camp, Sagrada Família, Park Guell and the beautiful Las Ramblas promenade. In addition to the many cafés, tapas bars are found all around the city and provide a culinary highlight. Piraeus is the historic port of Athens. Athens, which is Greece's capital city, is the historical capital of Europe and is bursting with culture and history. Highlights of Athens are the Acropolis and the vast numbers of temple situated around the city which are superb examples of Ancient Greek architecture. In addition, there is a wide variety of museums, like the National Archaeological Museum which is the perfect place to discover the full extent of the historical importance of Athens. The blend of history, charm and beauty of Athens is sure to make it an unforgettable visit. Venice is a stunning city which has been on the UNESCO list of World Cultural Heritage since 1987. With its 175 canals and over 400 bridges, the city is full of character and is waiting to be explored along it's picturesque waterways in one of the many gondolas. St. Mark's Square is a real highlight of Venice, with St. Mark's Basilica being the heart of Venice, a beautiful blend of Venetian, Roman and Byzantine architecture which is sure to amaze all visitors. No matter where you wander in Venice you are sure to find stunning architecture, fine food and unforgettable experiences. Marseille, France's main port city, is rich in history which can be traced back to the year 600 BC. The beautiful Basilique Notre-Dame de la Garde is a focal point of Marseille and with its stunning hilltop location is the ideal place to look down over all of Marseille and beyond. The city is a blend of style and history, with shopping areas and modern architecture contrasted with historic sites in the old town and port. A trip by boat will bring you to the Château d'If, an impressive fortress on an island boasting turquoise waters, pristine beaches and spectacular limestone cliffs. Livorno is situated on the Western coast of Tuscany, and is a major Italian port. In spite of the large-scale destruction during the second World War II, the city still has many historic buildings, most of which can be explored with guided tours. The Fortezza Vechia is an example of these historic forts and climbing to the top of the Mástio di Matilde will provide you with a great view of the city and port. The Terrazza Mascagni is a wide promenade on the waterfront and is ideal for taking a stroll and enjoying the views as the sun goes down on the Ligurian Sea. The port city of Kotor lies at the southeastern end of the Bay of Kotor in Montenegro. The city is surrounded by up 2000 meter high mountains. In 1979 the city was included in the list of UNESCO World Heritage Sites. The 4.5 km long city wall and the Romanesque Cathedral of St. Tryphon Kotor are among the attractions. Kotor is an incredible historic city with several cathedrals and churches in the older part of the city. 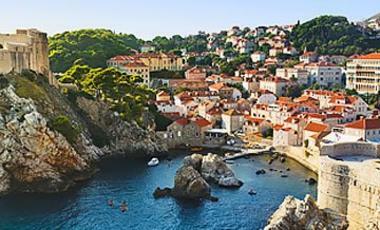 Dubrovnik, known as the 'Pearl of the Adriatic', is one of the main tourist locations in the Mediterranean. The Old Town and its many sights is the main attraction of Dubrovnik. This pedestrian-only Old Town holds a wealth of attractions from the city, and can be best discovered with the help of a tour guide. Dubrovnik has a very interesting history, including several wars, and this history can be explored from the city's ancient city walls. The main thoroughfare, also known as Stradun, is perfect for relaxing, enjoying a drink in a nearby cafe and watching the world go by. Valletta has about 6,500 inhabitants and is the smallest capital in the EU. Since 1980, the city is on the UNESCO World Heritage List. Thanks to the ring of bastions surrounding the city, Valletta is one of the best secured cities in the world. The Grand Master's Palace is surely one of the most magnificent sights of Malta. The St. John's Co-Cathedral, Fort St. Elmo, the Auberges as well as numerous museums, many of which deal with Malta's history are among the most noteworthy buildings. Naples is the third largest city in Italy, with about 1 million inhabitants. The port city sits next to a beautiful beach promenade and the city boasts many interesting buildings, such as castles, palaces,churches and monasteries. The historic center of Naples was listed as a UNESCO World Heritage Site in 1995. Naples food scene is exquisite with tantalizing Italian food, unforgettable seafood dishes and more the choice is endless. Monte Carlo is a city of the rich and famous, but also offers numerous attractions for regualr tourists. The Duke's palace high above the city, the casino and the Botanical Gardens are just a few of the highlights. AS Monaco is one of the most successful football clubs in the French League and a Formula 1 race takes place each year around the streets of the tiny nation. Thira is a Greek island located on the South Aegean Volcanic Belt. In the western part of the island, one sees clearly that is the remnant of a volcano. The crater rim, and other spectacular sights, testify to the volcanic eruption that occurred about 1600 years BC. The inhabited parts of the island are known for their beautiful white villages with colorful shutters and blue domes. In addition to historical attractions on the island, there are also many beautiful beaches. Málaga, with approximately 569,000 inhabitants, is the sixth largest city in Spain. Due to the favorable climate of Malaga, it is one of the most popular tourist destinations in the Iberian Peninsula. Several museums and buildings characterize the city. From the Alcazaba, a Moorish fortress from the 11th There century to the Catedral de la Encanacíon to the birthplace of painter Pablo Picasso, Málaga has much to discover and admire. 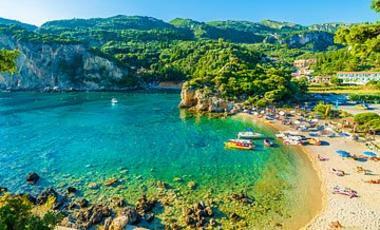 The second largest of the seven Ionian Islands, Corfu, is often referred to as 'the green island'. Among the attractions of Corfu is the Achilleion, a palace of the Empress Elizabeth of Austria, the old town and the viewing point 'Bella Vista' at Paleokastitsa. In the centre of Corfu is the Panagia Spiliotissa Catherdral and Platiteraklooster. Palma de Mallorca is the capital city of Majorca and stretches along the bay of Palma along the south coast of the island. The Gothic cathedral La Seu is the main attraction of the city. With its beautiful beaches Palma de Mallorca is a very popular tourist destination. To get around the old town, you will go through many staircases and narrow streets. A sight definitely worth a visit is the King of Spain palace. The Old City where you will find small, quaint museums and galleries as well as the town hall. The Mediterranean is Europe’s answer to a sun-soaked holiday of golden beaches, exciting cities and a wide variety of cultures. The ‘Mediterranean’ derives from the Latin “in the midst of lands”, and is very true to its name! With access to Europe, Africa and Asia, a cruise along the Mediterranean coastline offers an experience like no other. Explore Europe’s bustling cities, many of which are steeped in rich history and are bursting with flavourful cultures, ancient history, beautiful architecture and diversity. Cruises in this region offer a vast array of wondrous holiday destinations with delectable cuisines. The mixture of cultures, languages and religions is intriguing and alluring. The Mediterranean coastline is ringed by a winding coastline of scenic peninsulas and majestic mountains, overlooking a glistening electric-blue sea. There is a great range of beautiful ports throughout the Mediterranean including Malaga in Spain, Marseille in France or Naples in Italy – these are located in the Western region. You can also explore places like the Israeli city of Haifa or the Cyprus port of Limassol in the Eastern Med. Sail to the world famous city of Venice in the Adriatic Sea (the northernmost arm of the Mediterranean) along with the breathtakingly beautiful Dubrovnik, Croatia. Cruise ports along the African coast are also gaining popularity: Algiers in Algeria, Tunis in Tunisia or Casablanca in Morocco. There are so many cultures and traditions around the Mediterranean region just waiting to be explored and enjoyed. Gibraltar is one of the most prominent ports in the Western Mediterranean. This ‘piece of Portsmouth’ has been British for nearly as long as it has existed, so its Palladian architecture, afternoon tea cafes and fish and chip shops are all part of the culture. The eccentric and exceedingly international city of Tangier is also featured on many of the Western Mediterranean cruise itineraries. However, this part of the Mediterranean is mainly attractive for those wanting to cruise to Spain. Immerse yourself in all Spain has to offer – sample the area’s warm culture and delight in some tempting tapas in one of the many bars and restaurants. Take a stroll along Cadiz’s narrow cobble-stoned streets and discover one of Andalucía’s unjustifiably best kept secrets in Spain’s southernmost province. Explore its impressive yellow-domed cathedral which dominates the cityscape and overlooks the turquoise waters of the Atlantic Ocean. Discover the other coastal cities’ ancient architecture – cruise to Malaga, Cartagena, Valencia and, of course, Barcelona. For a cultured mix of sunny beach resorts, traditional fishing villages, sprawling cobbled streets and rolling vineyards look no further than the island of Mallorca. This enchanting Balearic Island has always been favoured by tourists for its ambience, sun-fuelled atmosphere and golden sand beaches. Sicily is the biggest island in the Mediterranean Sea and is also one of the most popular cruise destinations in the world. The island features a number of busy port towns but the port of Messina is by far the largest. It is here or in Palermo, Trapani or Syracuse that you can start exploring this pearl of the Central Mediterranean. Walk in the foothills of Mount Etna, visit Golfo di Castellammare, wander along the picturesque streets of Sicily’s towns and villages, visit the many ancient ruins and castles and, definitely enjoy the famous local pasta alla Norma and a Cannoli. Central Mediterranean is also a gateway to the Adriatic Sea. The intense colours, dazzling views and beautiful architecture of the Adriatic coast are world famous. There is a spread of countries you can visit, from the eastern-flavoured Montenegro to the mountainous San Marino. Croatia with its island-speckled coastline is one of the star attractions of the Adriatic, followed closely by the beautiful lagoons and marble palaces of Venice. Whichever route you go for, you are sure to experience some of the best of European culture and heritage here. Cruises in the eastern part of the Mediterranean Sea have a different flavour to those in the central and western areas. Visiting Greece and the Greek isles will take you back over 2000 years. The country is full of places where you will feel like you are in another world, like the Acropolis or the monasteries of Meteora. Enjoy also the modern side of Greece and its festivals, white-sand beaches and world-class kitesurfing. Cruises around the east of the Mediterranean will include some of Turkey’s most stunning ports, like Bodrum, Marmaris and Kusadasi. Experience the lyrical landscapes and magical scenery of the eastern Turkish coast and then cruise on to the sun-soaked beaches and ancient riches of Cyprus. The friendly locals will welcome you with open arms, making the whole Mediterranean cruise experience even better. How much does a cruise in the Mediterranean cost? On average a 7-10 night cruise in the Mediterranean will cost between $1,700 - $2,300. Prices do vary between season and there are plenty of deals to be had. If you want to stay in the Mediterranean a little longer, then 20 night cruise costs around $3,000 on average. Prices are per person and based on two people sharing. For all the best deals, browse through our individual destination pages – some of them are highlighted above. 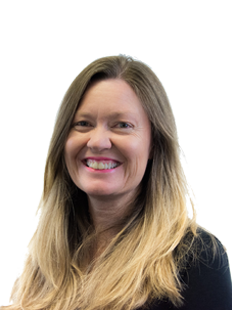 If you would like to get detailed advice and help finding a cruise that is suited entirely to your needs give our Cruise Experts a call on 1300 887 590. Making last minute travel plans? Search through our last minute cruise offers and find the best option for you. If you're on a tight budget, check out all the cruises under $999. All cruises are available on our homepage and through our Cruise Experts. Call now on 1300 877 590.